Transformers Retail Sightings - Rebooted! 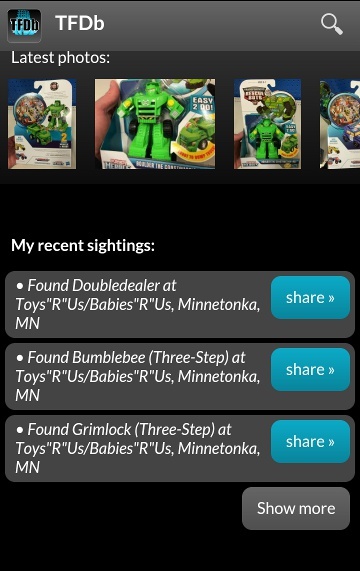 We're excited to announce the latest new feature in TFDb* -- now with a few taps of your phone, you can share your latest Transformers retail finds on Facebook, complete with a photo of your find. It's a whole new world for Transformers Sightings! Now, I know what you're all saying - it's just too much change! It's too revolutionary, and the public will reject it! Well, we're here to tell you (as fans) - this is a really fun way to make & share your Transformers finds. Try it out, and we think you'll never look back. Join us on TFDb today! * TFDb is our new mobile app for iPhone & Android. If you haven't tried it, now's a great time to hop on board. Download it now! 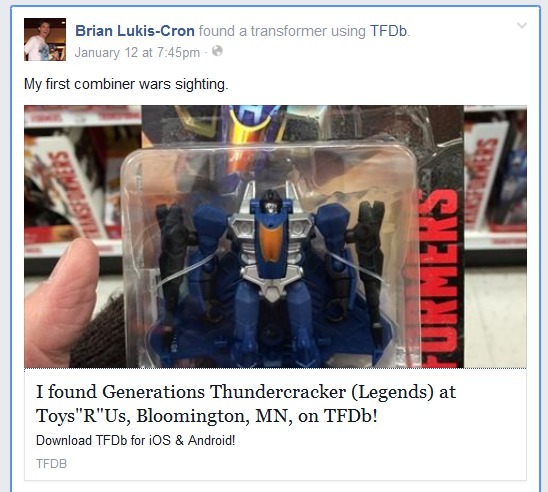 Re: Transformers Retail Sightings - Rebooted! Remember to try it out next time you're at the toy store. Honestly, it's fun.